Julie Ann Wrigley is the President/CEO of Wrigley Investments, LLC in Sun Valley, Idaho, Managing Member of Wrigley Ranches, LLC in Weatherford, Texas and President of the Julie Ann Wrigley Foundation. Julie is a passionate proponent of sustainable societies: the concept that considers the interconnectedness of environmental, economic and social systems. In 2004 she helped co-found the Global Institute of Sustainability (GIOS) at Arizona State University. Within GIOS resides the first-degree granting School of Sustainability in the US. Much of her time is spent with her philanthropic work not only in environmental sustainability, but also health care and education. 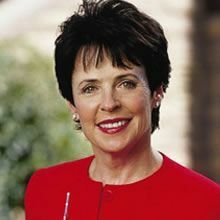 In 2007 the State of Arizona honored Julie with the 2007 Outstanding Philanthropist Award. Along with Dr. Michael Crow, President of ASU, and Rob Walton, retired Chairman and past president/CEO of Walmart, Julie serves on the Board of Trustees for the Global Institute of Sustainability at ASU. She continues her commitment to the USC/Wrigley Institute for Environmental Studies, which she and her late husband, William Wrigley, helped create, along with USC President, Dr. Steve Sample and long-time friend, personally and professionally, Dr. Morton Schapiro, President of Northwestern University in Evanston, Illinois. After two years of practicing law in Denver, Julie met and married William Wrigley. Mr. Wrigley was President, CEO and Chairman of the Wm. Wrigley Jr. Company for almost 40 years until his untimely death in 1999. In addition to assisting her husband for special projects and founding and creating Wrigley Management, Inc. Julie served on the Boards of Directors for E.W. Scripps, Associated Bank of Chicago, First Bank of Idaho, American Eagle Group, and Wyndham Foods. Julie has been able to commit a great deal of her time to philanthropic endeavors including board involvements with Northwestern Memorial Hospital in Chicago, Peregrine Fund (Chairman Emeritus), Santa Catalina Island Conservancy, The Nature Conservancy, The World Wildlife Fund, Keep America Beautiful, Sun Valley Writer’s Conference, ASU Foundation, Stanford University’s Freeman Spogli Institute for International Studies, Ray C. Anderson Foundation and the USC/Wrigley Institute of Environmental Studies. In 2016 Julie was the recipient of the “Pioneer for the Planet” award presented at the East-West Sustainability Summit in Honolulu. Julie Wrigley tries to live her life understanding that our goal as human beings should be to recognize that we can create development that meets the needs of the present without compromising the ability of future generations to meet their own needs.